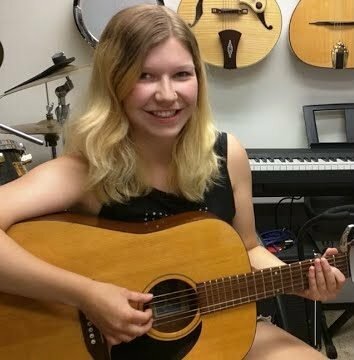 Seventeen-year-old Elle has only been playing guitar for eight months, but she’s already learned a remarkable variety of songs by Vance Joy, Spoon, Of Monsters and Men, Counting Crows, Third Eye Blind, and The Shins. She even played and sang lead vocals on Green Day’s “Holiday” on stage with a band, on short notice to boot. Not a bad start so far!